Status: Phase I broke ground October, 2014. 53-story tower with 538 rental apartments and 20,000 square feet of indoor and outdoor amenity space. Journal Squared is located on a 2.23 acre site owned directly adjacent to the Journal Square Transportation Center. It is fully entitled for 2.4 million square feet of mixed-use multifamily housing and retail development. When complete, Journal Squared will be three high rise towers of 54, 70, and 60 stories, comprised of 1,840 rental apartments, 36,000 square feet of retail space, and 920 parking spaces. In addition, the project will feature a sweeping plaza along Magnolia Avenue that will engage pedestrians, provide a kiss and ride for commuters, and allow easy, safe access to the PATH train. 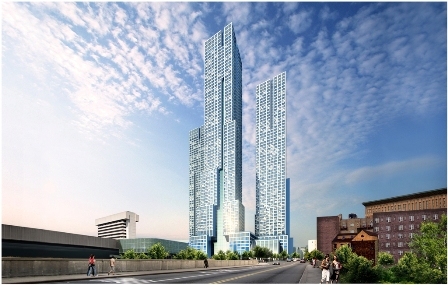 Journal Squared’s three towers will be constructed in three phases. Phase I of Journal Squared, which officially broke ground in October, will include the 53-story tower, the pedestrian plaza, and the majority of site work required for the three phases. Approximately 505,611 gross square feet, the tower will house 538 rental apartments, 139 interior parking spaces, 72 surface parking spaces, and 20,000 square feet of indoor and outdoor amenity space. The building has been meticulously designed in a collaboration between architects HWKN and Handel Architects. 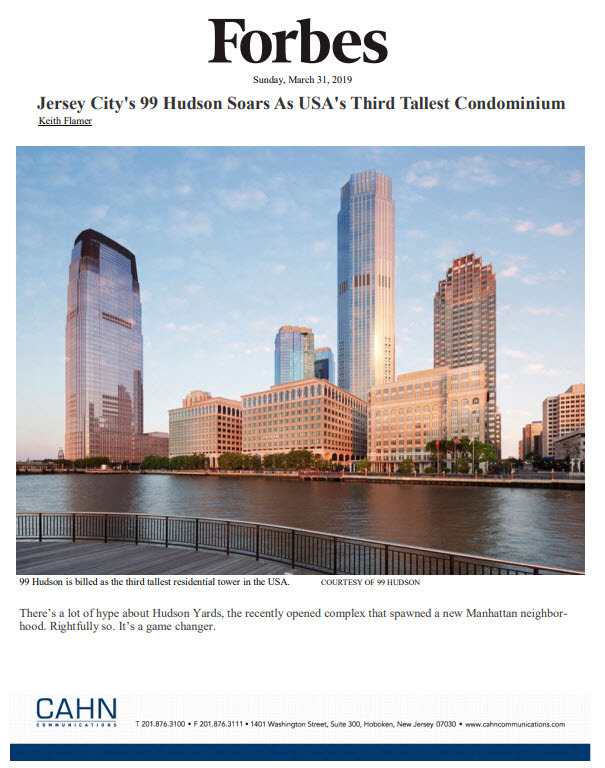 The tower is located on one of the highest elevations of Jersey City and will offer spectacular views of the New York City and Jersey City skylines even from its lowest floors. The entirety of the 8th and 53rd floors have been dedicated to resident amenities. The 8th floor amenity level will feature a state-of-the-art 2,000 square foot gym, residents’ lounge, media room, an outdoor pool, and a communal vegetable garden. The 53rd floor Sky Lounge will provide every resident access to panoramic penthouse views. In addition, residents will enjoy covered access from the building’s lobby to the entrance of the PATH train. Phase I of Journal Squared will have a mix of studio, one-, two-, and three – bedroom apartments. Each unit will feature heather gray wood flooring, low maintenance quartz countertops, high gloss lacquer finished cabinetry, ceramic tiled backsplashes, stainless steel appliances, full size washers and dryers, and central-air-like temperature controls (a rarity in the Jersey City rental market).